In the Spring of 2012 Odisea delivered the design of the waste water treatment plant for the future garrison that is currently under construction in the Badghis Province, North of Herat in Western Afghanistan. 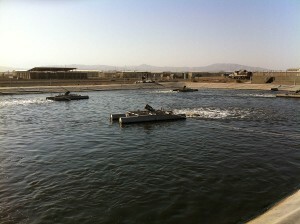 The system is a partially aerated lagoon with sludge drying beds. ECC International is the primary contractor on the project. The project is located along a river on a sloping site, which created grading and drainage challenges. Configuration of the plant aeration lagoons, settling ponds and drying beds were particularly difficult given the area allocated for the treatment plant. Odisea performed services on-time and within budget. The design has received very few comments during the review process by the U.S. Army Corps of Engineers (USACE). The plant will treat approximately 596 cubic meters per day (~160,000 gpd) and can be scaled up or down as usage varies. The use of aerated lagoons has been part of USACE contracts for a few years due to the need for simple systems that require little maintenance and are relatively easy to operate.